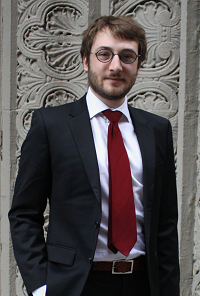 Stéphane Francioli joined Stern’s M&O doctoral program as an Organizational Behavior PhD candidate in September 2015. Currently, Stéphane works primarily on construal level theory and age at the workplace. With Batia Wiesenfeld, he uses contrual level theory to explore audience’s inferences of agent’s construal preferences. For instance, Batia and Stéphane currently investigate the effect that concrete or abstract presentations of new entrepreneurial projects have on investors’ perception of the ventures’ potential and entrepreneurs’ competence. With Michael North, Stéphane explores issues related to age at work. Longer life expectancy presses authorities to push retirement age further away, such that four generations are now sharing the workplace. In this broad context, Mike and Stéphane investigate power and status dynamics in age incongruent vertical dyads (i.e., supervisors younger than subordinates). Stéphane received a dual B.A. in International Trade and Finance from ESCE, an Msc. in Management from the London Business School, and a MS in Management Studies (spec. Organizational Behavior) from MIT Sloan. Prior to entering his doctoral training, he worked at Procter & Gamble, and officiated as an RA at MIT Sloan’s Behavioral Lab and Paul Harris’ developmental psychology lab at the Harvard Graduate School of Education. Lane, J. D., Ronfard, S., Francioli, S. P., & Harris, P. L. (2016). Children’s imagination and belief: Prone to flights of fancy or grounded in reality?. Cognition, 152, 127-140.